(York, Pa., July 19, 2017) - The York Revolution announced today the contract of infielder Angel Franco has been purchased by the Arizona Diamondbacks. Franco becomes the third Revs player and second infielder to sign with a Major League organization since spring training, joining shortstop Josh Wilson (Texas Rangers) and lefty reliever Jarret Martin (San Francisco Giants). Franco batted .274 in 66 games played for the Revolution, totaling four separate six-game hitting streaks during the course of the year. Franco tallied 71 hits, 36 runs scored, 12 doubles, four home runs, and 21 RBI. He also provided the Revs with a steady glove up the middle, making 33 starts at shortstop and 32 more at second base, helping lead a York defense that is tied for second in the Atlantic League in fielding percentage. Franco strung together a 29-game errorless streak at one point. 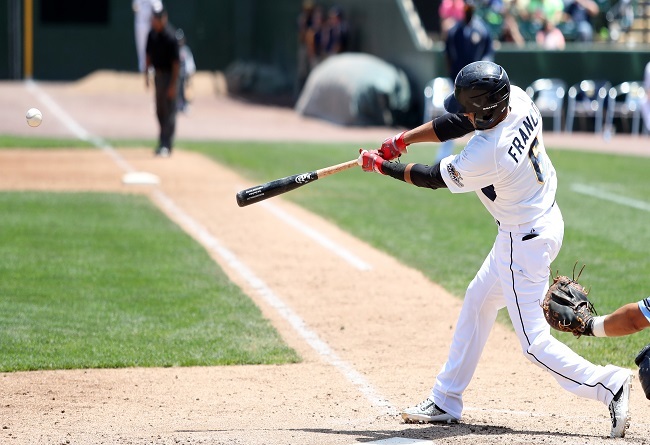 Franco posted back-to-back three-hit games for the Revs, May 20-21, and tallied three consecutive three-hit games, June 21-23, including a 3-for-5 performance with a home run and two doubles. He scored the winning run in a walk-off victory over the Lancaster Barnstormers in a suspended game from June 23, completed on June 25.